And it doesn't cost you anything. The Milelion is free and will always be. Different websites have different ways of staying free. Some websites have annoying autoplay video ads. Others have adblock blockers that obnoxiously take up your whole screen and demand you unblock them. Still others have a big popunder asking them to subscribe to a spammy newsletter. The Milelion doesn’t go for any of that. All ads are non-obtrusive and on the sidebar. Block them if they annoy you (but if they don’t, consider whitelisting). The newsletter is yours to subscribe to via the small box on the left. You won’t get a begging signup box blocking your screen. And autoplay video ads? Come the revolution, any website with those will be first against the wall. But ultimately, The Milelion needs to be sustainable. And I’d prefer to do this in the least intrusive way possible. That’s why we’re going to start putting affiliate links in some articles for ANZ, Citibank and Standard Chartered credit cards. HSBC will follow soon. UOB and DBS, unfortunately, do not partner with the affiliate network I’m using but we might be able to get them through a 3rd party finance site. How these links work is simple- if you read about a credit card that sounds like something you might like, sign up for it through our link. We’ll earn a referral fee. Signing up this way still makes you eligible for whatever sign up bonus/gifts the banks offer. 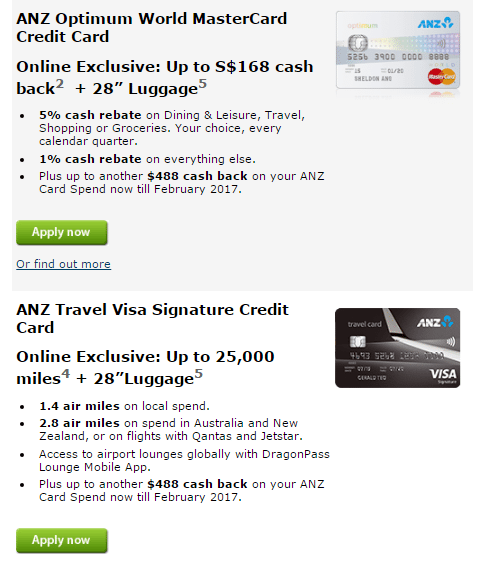 And if you sign up for the Travel Visa Signature Card, you’ll get the 25,000 bonus miles and 28″ luggage, subject to meeting the regular T&C. Remember- I don’t see any of this money. All costs incurred in running The Milelion (social and otherwise) are borne by me. All revenues earned by the site until 31 July go to support World Vision. We’re a bit lower than I was expecting at this time in the campaign, but hopefully with the additional revenue from affiliate sign ups we’ll meet the $5K goal. Final point: I understand people might be concerned about how this affects content objectivity. That’s fair enough. The last thing I want is this becoming the kind of website that can say with a straight face that the Krisflyer Ascend card is a good option(I swear, they updated the headline to add “Or the worst?” since I last read it). Let me put it this way- over the past 2 years The Milelion has been in existence I’ve made it clear I’d rather die than recommend a crappy card to someone. 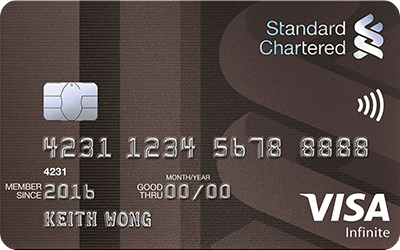 And although there are some great affiliate offers for crappy cards, including a particular mall-related AMEX that I have described, rather charitably, as possibly the worst card in Singapore, I’m not going to put those links here. I trust you have the right resources here to know which cards you should and shouldn’t be applying for, if you want to play the miles game. I’m going to put some links below, but I will progressively populate older articles (like my good friend the Milelion Credit Card Omnibus) with these as well. UPDATE: I’d advise against applying for this card given the recent cuts to benefits. No more 10k miles when paying the annual fee. 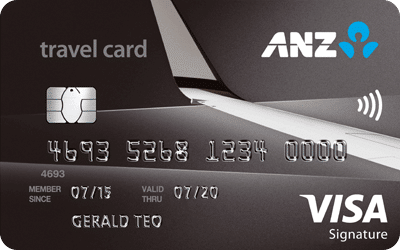 Despite the recent devaluation of the lounge access benefit, the ANZ Travel Visa Signature remains a solid card to have assuming you travel frequently to Australia/NZ. You can get up to 25,000 miles if you’re willing to pay the first year annual fee and spend $3,000 in the first month. 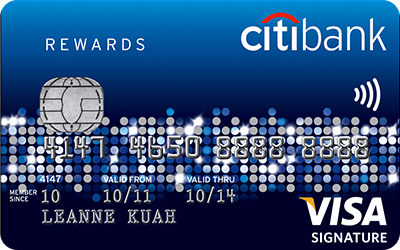 The old stalwart of the rewards card portfolio, the Citibank Rewards may have lost some utility ever since bill payment via AXS was taken away, but regular promotions like the one with Amazon make it a solid card to have in my book. I don’t love Citibank’s policy of having separate redemption fees for ThankYou points and Premiermiles, but I do love that they have the most useful transfer partners of any SG based bank. 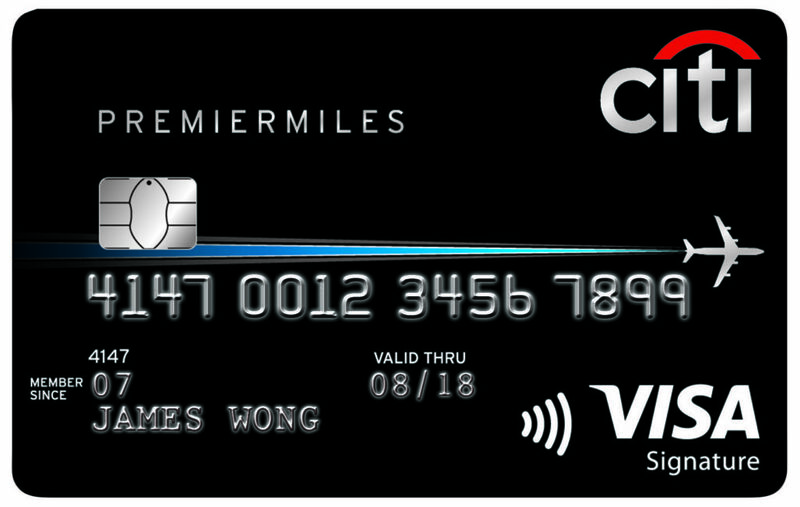 For the full runthrough you can refer to the Citibank entry in the credit card omnibus. If you opt for (1), you are essentially buying miles at 1.68 cents each. This is one of the lowest rates I’ve ever seen for sign up/renewal bonuses. There are some decent card related bonuses too, and if you’re the sort who puts at least S$2K spend on your card each month you can earn 3 mpd on overseas spending. We’ll add more links once HSBC comes through, hopefully there’ll be another extension to the 10X points on the Advance Card? Thanks, Arron. I am always looking forward the application promotion for Citi Prestige. However, they never come maybe SG market is too small! Kudos on the transparency, really appreciate it esp the part on your content objectivity! I just have one wish for this site is the vision to be more towards travel hacking from SIN…rather than a pro SQ,*A, Lifemiles website…. BUT great work so far Aaron! More power to you Aaron, keep up the good stuff. Thanks for all the info. Definitely will apply thru your link for new application. Keep up the good works ! Previous Entry How does this Krisflyer devaluation compare to previous ones?